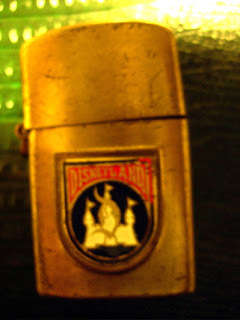 This is a cigarette lighter from Disneyland. It is quite small, perhaps the size of the display screen on your cell phone. It's a real lighter, though. I've had this thing for over 20 years, although I cannot remember who gave it to me. It's cute, but not a toy. Notice the "D" for Disneyland, and the castle logo.